Recently, I’ve launched onto an impromptu project, working out a way to do the Celestial Tournament with only tamed battle pets. It’s rather hit or miss thus far. This little moth, added in 5.4, is fairly instrumental in my strategy for that. Don’t let its cute, glowing particle effect fool you. It has a very unique combination of abilities which turns him into a veritable beast killer. Taming one is a bit of a challenge. 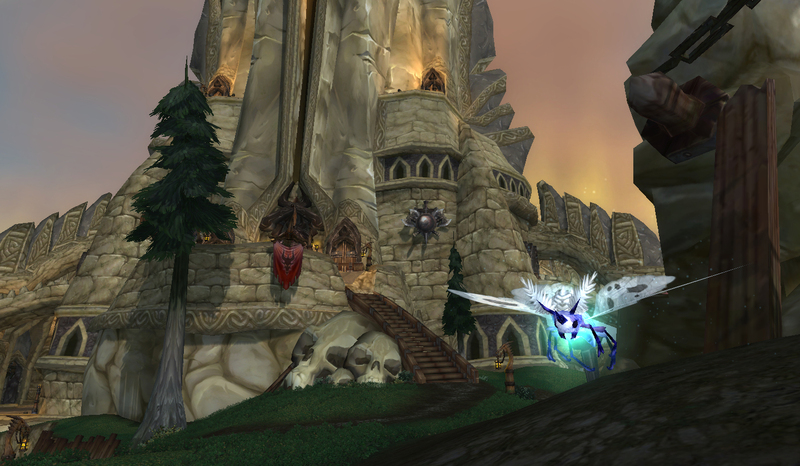 In order to get to the spawns, you have to be able to access the Timeless Isle. I’d also suggest going on a character with a bit of offensive firepower and some kind of slowfall or a Goblin Glider. A mage is really excellent. In order to access these guys you’ll need to hitch a ride on an albatross. 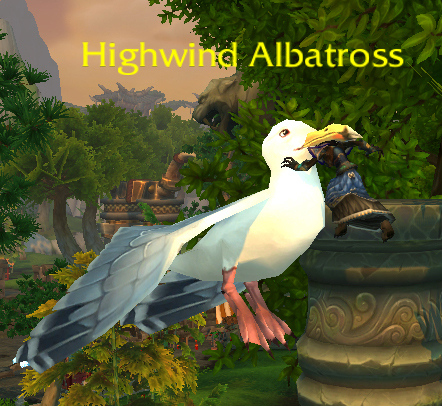 It’s not a very, let’s say, pleasant proposition for your character, especially since those albatrosses like to take their sweet time sauntering their feathery behinds around, but doing so is fairly key for accessing several different things on the Isle. Once I get past the areas with a lot of player foot traffic I usually try to get the albatross down so that just a couple of hits will kill it, because if you overshoot your target it’s quite the pain in the behind. You may need to do this several times to get the breed or rarity you’d like too. The reason for the slowfall is that there are only 2 ways down. Either hitch another long, circuitous ride with another albatross, or jump. The reward is worth it. This is one of the best pets to kill Beasts, bar none. Aside from the largely unattainable Dragon Kite ($80 USD or so on ebay at the time of this post) this is the only Flying pet with a mechanical ability, making it both offensively and defensively strong against beasts. This guy is particularly suited to go up against Xufu because his Cocoon Strike ability can be timed to intercept either Xufu’s Feed or the enormous first hit of Moonlight. Many moths have Cocoon, but lack the offensive firepower to beat Xufu down before his next Feed. Call Lightning is a game changer. For Xufu and this tamed-pets-only project specifically I’m pairing him up with the very few mechanical tames that are out there. So very, very few tames. A fast Cogblade Raptor with Exposed Wounds and Batter in particular makes for a really nice combo. Were I not limited to only tames I’d also strongly suggest the Clockwork Gnome, a long-time favorite here at the Roundup to pair with Call Lightning. If you’re using the Call Lightning ability I highly recommend using the Moth’s multi-hit Slicing Wind over Reckless Strike. Call Lightning shares a slot with Moth Dust, which has a chance to stun. 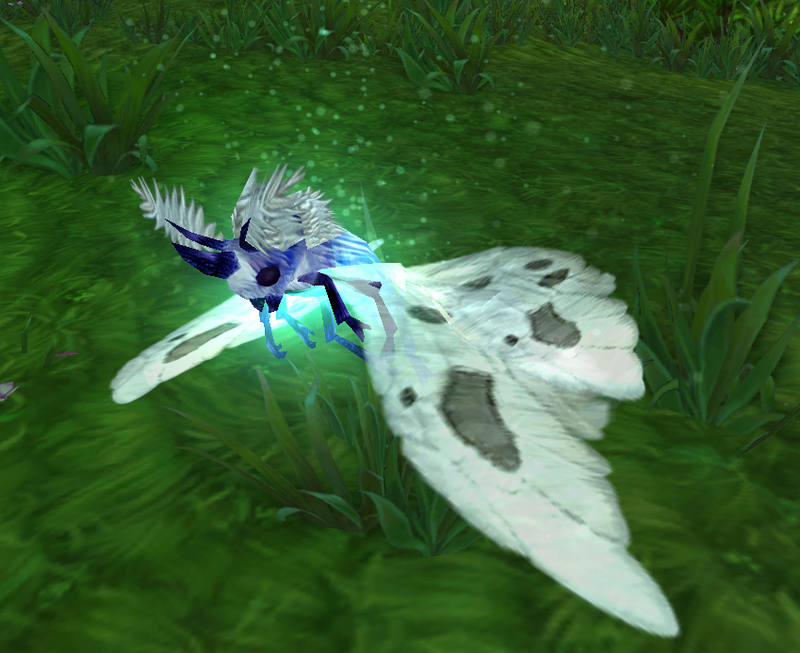 It’s a decent ability, and it’s also key in many strategies which use other moths, making this particular moth kind of a 2-for-1 battle pet. A fun ability which isn’t quite as functional in the situation I’m planning for here is Counterspell. Because it doesn’t ‘silence’ the ability along the lines of Nevermore, or even put it on cooldown, Xufu will just Moonfire or Feed on his next turn. Sometimes this delay is excellent strategy but here it’s far better to just absorb it. Beyond the battle mechanics, for me personally this little guy will be an excellent companion as I make my way into Warlords of Draenor. With the ban on flight until 6.1, he will be an excellent reminder of the times I took to the sky and flew among the stars. Well, in the mouth of an albatross but lets not get too picky here because I’d rather not remember that part. 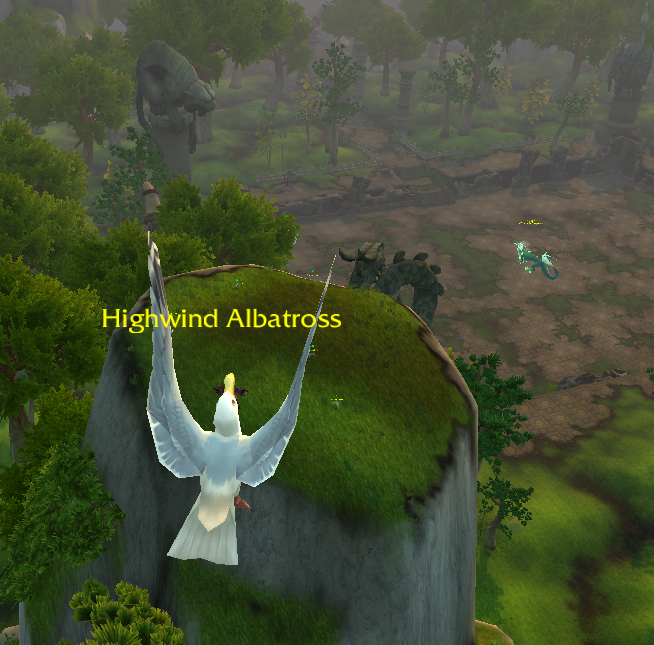 This entry was posted in Uncategorized and tagged 5.4, albatross, celestial tournament, flying, pet profile, tamed, timeless isle on December 4, 2013 by Liopleurodon.